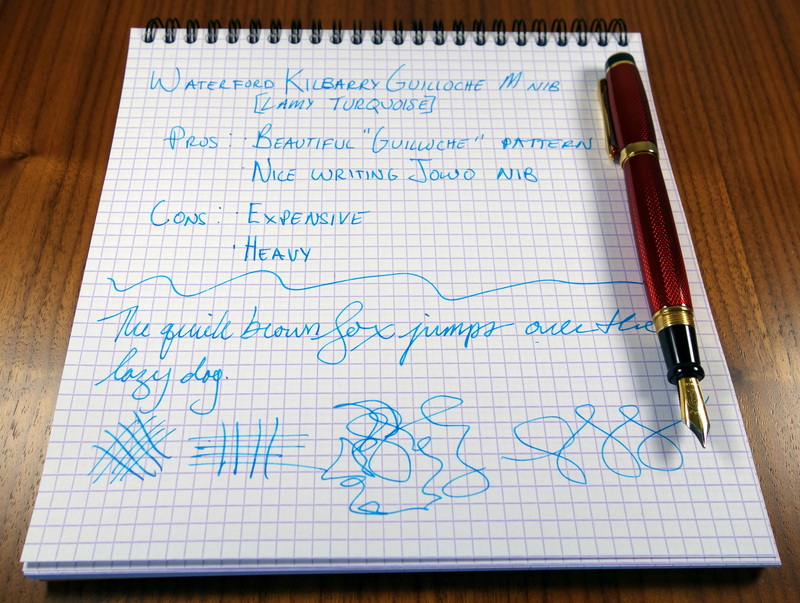 Waterford is synonymous with fine leaded crystal, so I was surprised to learn that they make fountain pens (or at least have someone else make fountain pens under their name). If you search for “Waterford Kilbarry” you will see plates and flatware under the same name, though I don’t see much correlation in design. The most interesting feature of the Kilbarry is the amber-colored solid brass body which features an engraved “guilloche” pattern that is covered in a clear lacquer. This design gives the body some depth and it shimmers in the light. The rest of the pen is decidedly less interesting. The gold furniture and black end caps are not that appealing when taken in as a whole. 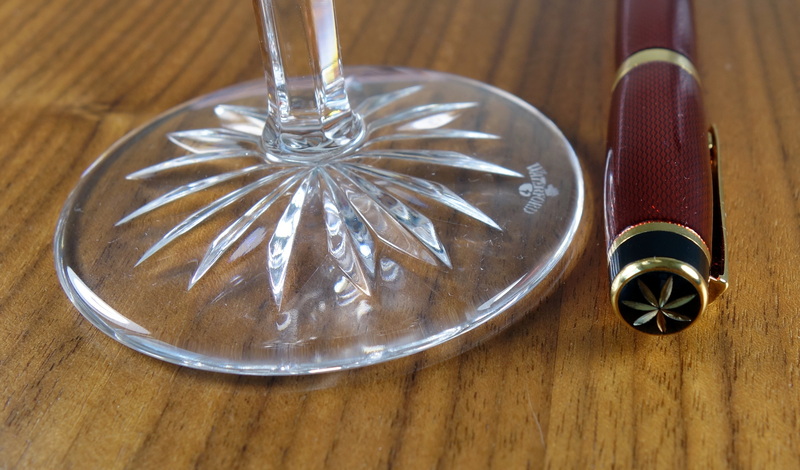 The top of the cap features the Waterford star symbol which does resemble a classic Waterford crystal design. Waterford crystal martini glass base with star design. The nib performs beautifully with a fat, juicy medium line. I have experienced no issues with hard starting or skipping. The Klibarry takes standard international cartridges and converters. The grip section is made out of black plastic with no seams that I can detect and the cap posts nicely on the the back of the pen. 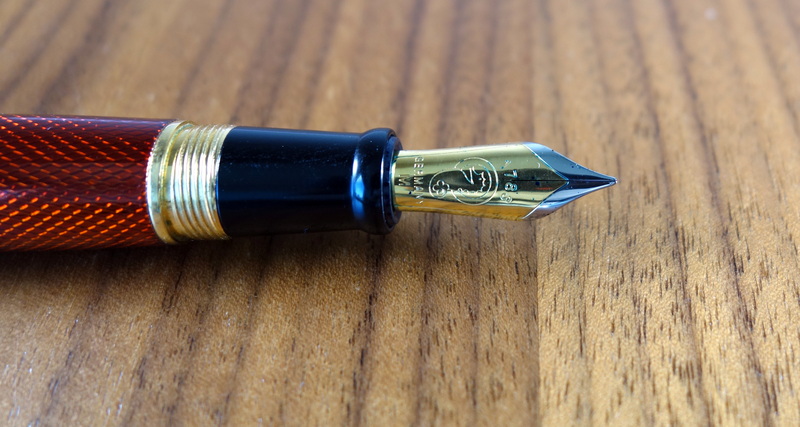 Being that the pen has a solid brass body it weighs almost 41 grams (with the converter installed). The pen is well balanced when posted but I find that I prefer to write cap off with this pen. Capped, the pen measures 5.25″ and about 4.8″ uncapped. At it’s widest point the Kilbarry measures just over half an inch. The build quality overall is quite good, the Waterford star on the top of the cap isn’t cut as crisply as it could be but otherwise there are no real flaws to speak of. I don’t know where this pen is made but I would suspect it is made somewhere in Asia. The Kilbarry feels nice in hand and writes very well but ultimately it’s not my cup of tea. The $135 retail price is quite high and I think this pen would make more sense around $70.